Los artículos determinados (The determinant articles or definite articles). In this lesson we will learn that we use certain items (el, la, los, las) before a noun when we talk about something we know or have mentioned before. It is called artículos determinados. The car of Juan is red. Alba is lost. She is in Madrid. Madrid is a big city. Alba is on an avenue. On the avenue there are many trees and too much traffic. Alba: Excuse me, sir, where can I find an ATM? Alba: Esteban, is that you?! How are you? Esteban: I’m fine. And you? Alba: I’m tired. I’m worried because I’m lost. My sense of direction is not very good. Where can I find a bank? Esteban: There are many banks in this neighbourhood. There is a bank there. It is between the hospital and the library. Alba: Isn’t there another bank nearby? Esteban: Yes, the local bank is here. It’s exactly to the right of the bookstore. Alba: Is it near the corner of the street? Esteban: Yes, there is an ATM on the facade of the building. Alba: Great. And where can I find a pharmacy? Esteban: A pharmacy? Are you 3sick? Alba: Yes, I’m a little sick but it’s not serious. I have a cold. Esteban: It’s a good idea. In the pharmacy you can find aspirins. The pharmacy is on the left of the supermarket. There are also other stores. Alba: Is it in front of the parking lot? Esteban: No, the pharmacy is not in front of the parking lot. It is behind the cinema, next to the language school. It is near the town hall square. Alba: Uff, there are many places on the avenue. And I’m really dizzy! Where is a bank/Where can I find a bank? Estudiamos que usamos determinados artículos (el, la, los, las) antes de un nombre cuando hablamos de algo que conocemos o hemos mencionado anteriormente. We study that we use certain items (the, the, the, the) before a name when we talk about something we know or have mentioned before, the definite articles. It is called artículos determinados. But in Spanish we also have Artículos indeterminados or indeterminate articles, indefinite articles (un, una, unas, unas: a/an in English). They also go before the noun and we use them when we refer to something unknown or this is the first time we mention it. I hope the examples on artículos determinados / definite articles and artículos indeterminados / indefinite articles helped you understand them better. 1- Where is Alba lost? Alba is lost on an avenue where there are many trees and too much traffic. 2- What question does Alba ask the gentleman? Alba asks where there is an ATM. 3- How does Alba feel? Alba is tired and worried because she is lost. 4- Are there many banks in this neighbourhood? Yes, there are many and there is one between the hospital and the library. 5- Is there another bank closer? Yes, it is exactly to the right of the library. 6- What is Alba looking for? Alba is also looking for a pharmacy. 7- Why does Alba look for a pharmacy? Alba looks for a pharmacy because she has a cold. 8- Where is the pharmacy located? It is behind the cinema, next to the language school, near the town hall square. 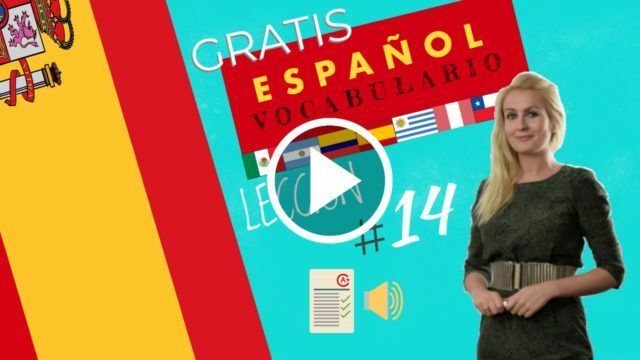 9- los articulos determinados in Spanish: Do you understand the definite articles in Spanish? Grammar exercise in which you have to choose the correct answer.